How to order an i-Drive? 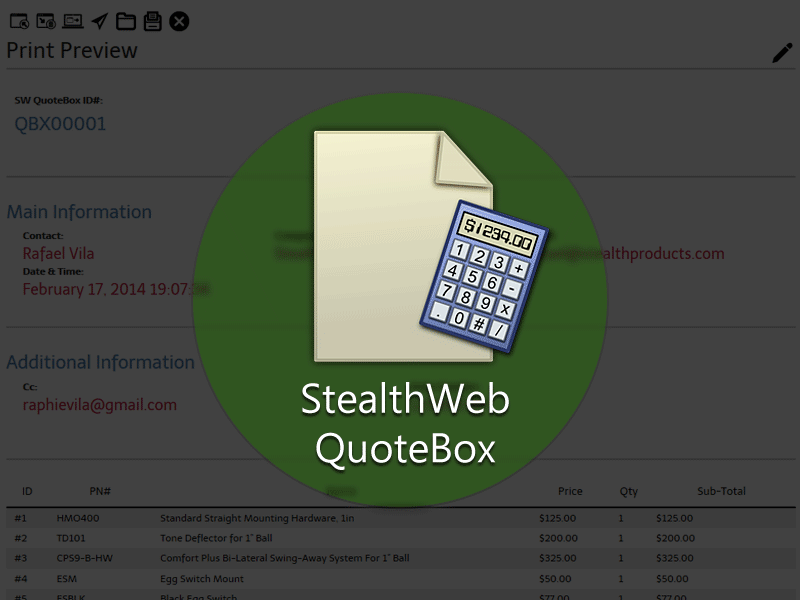 | Stealth Products, LLC. How to order an i-Drive? 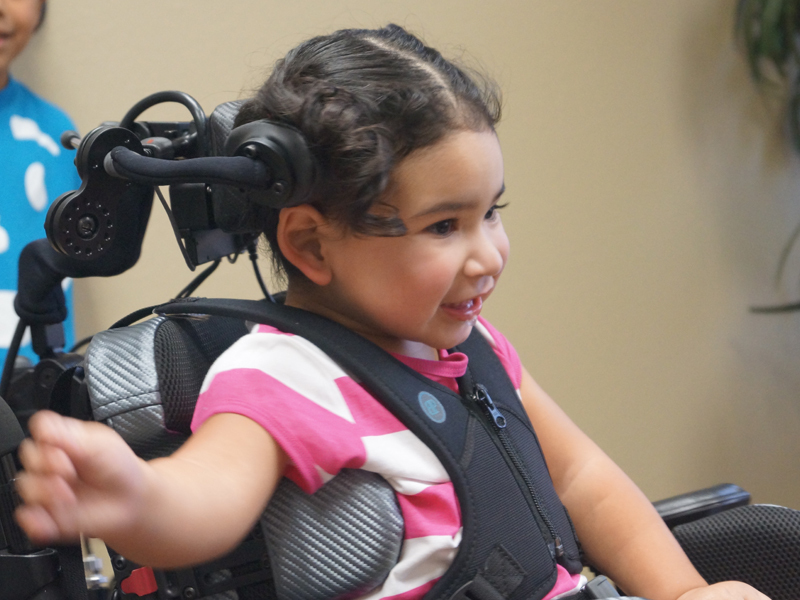 The i‑Drive is "Plug and Play" with most power wheelchair electronics*. 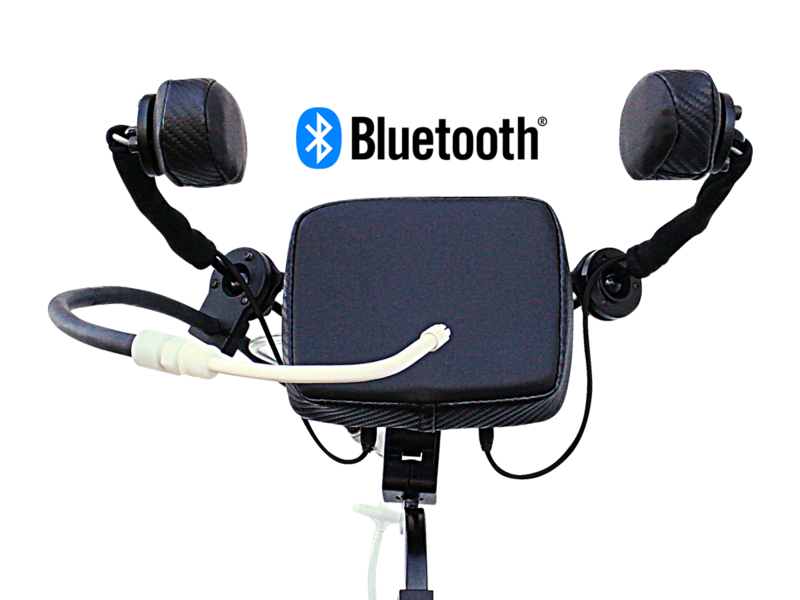 Compatibility is listed in the chart belowon the right by both power wheelchair brand and controller type. If you have one of the listed controllers on a different brand of chair, the i-Drive will still be "Plug and Play". 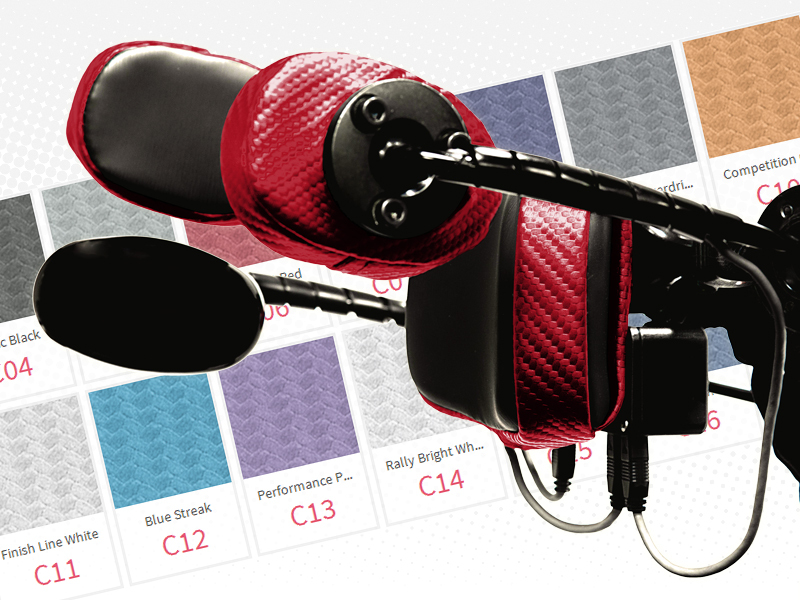 Please let us know about your equipment when ordering so we can ensure compatibility. IMPORTANT NOTEDimension tables do not display properly on small screens. 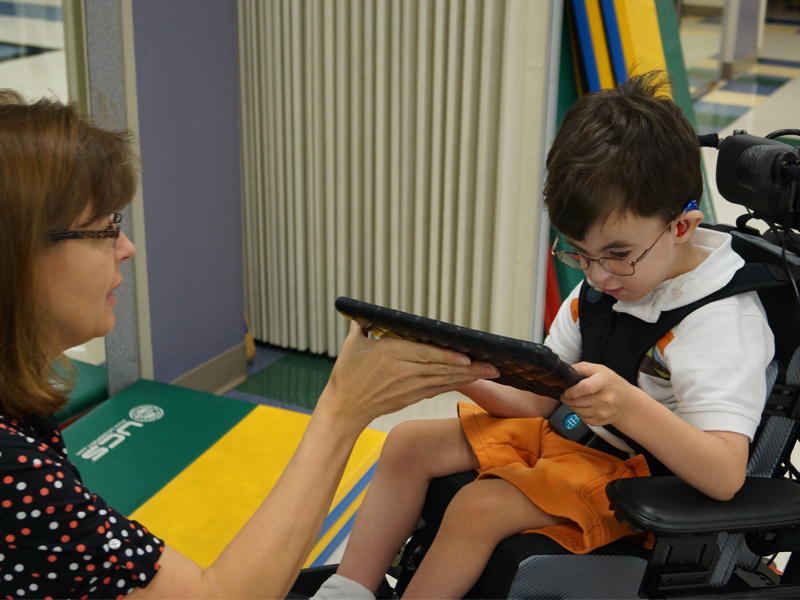 Download Power Chair Compatibility Chart table on your device below. What type of system you need. The individual's strengths and weaknesses. A better approach to selecting input types or combination of them. How to design a structure that adjusts to the individual. How to make the learning curve more intuitive and effective. 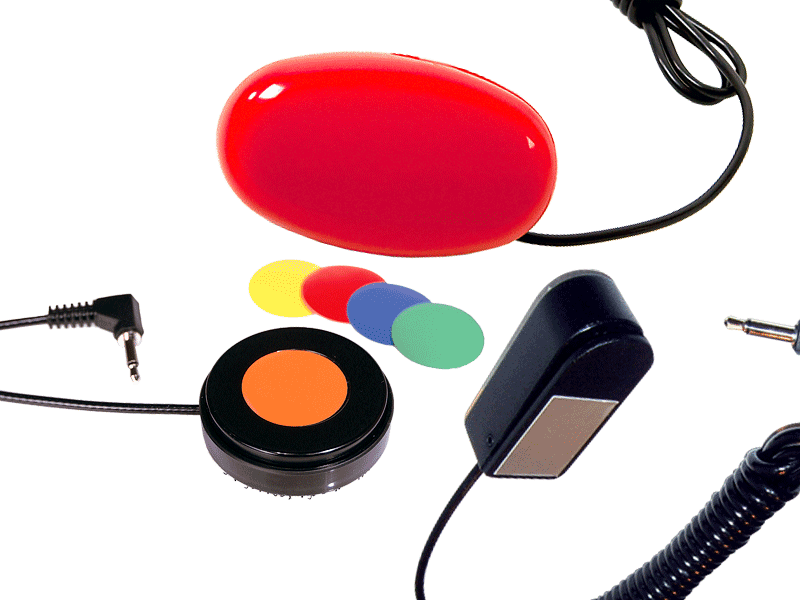 Many power wheelchair users require special driver controller demands and custom configurations. Our ordering process supplies basic drive systems that can be modified as needed, or we can configure a special system from scratch. 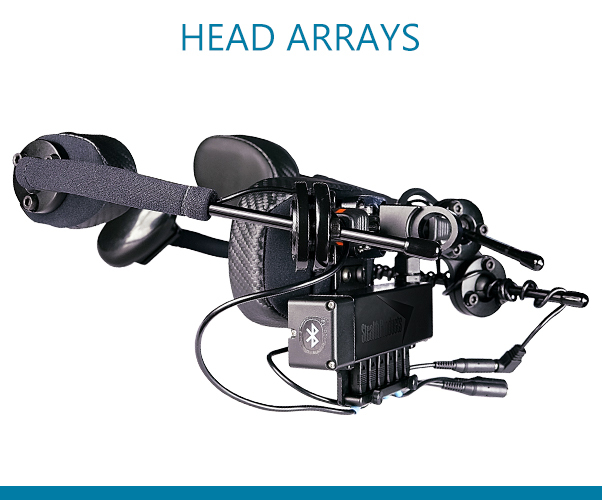 If the i‑Drive Head Array Pro System fits the positioning needs to maintain proper head posture at all times. 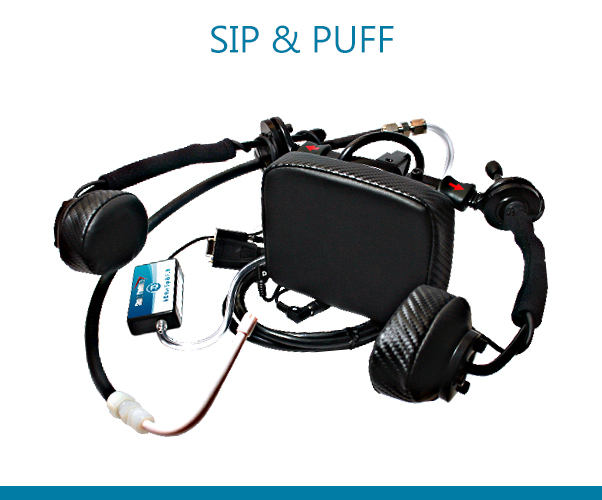 When combined with a Sip & Puff pneumatic switch, this will help compensate for motor skill limitations. By replacing one standard proximity switch with a fiber optic, the client is able to turn left by pushing the cheek with their tongue. 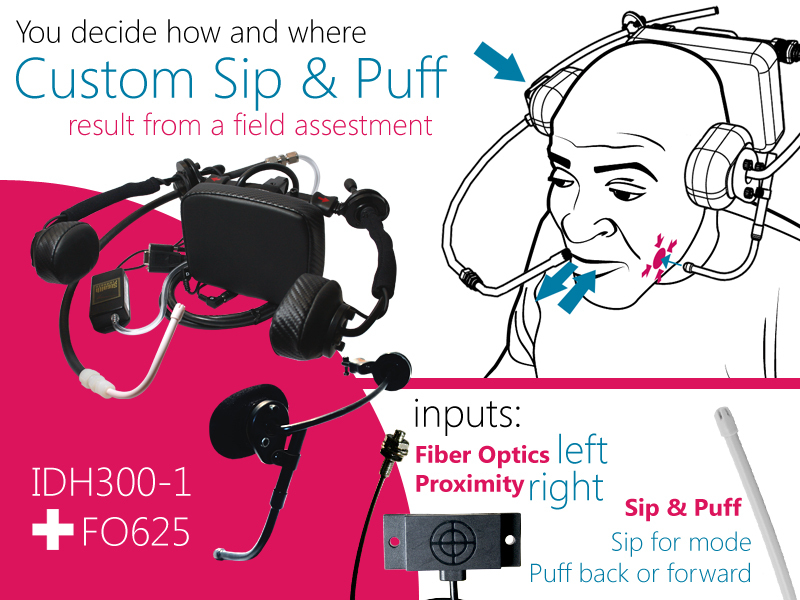 A right spot facial pad with proximity sensors were added for right turns with minimal effort, and a "puff" for back and forward and "sip" for reset/mode was integrated. Click on the system you are interested the most to see more detailed information! 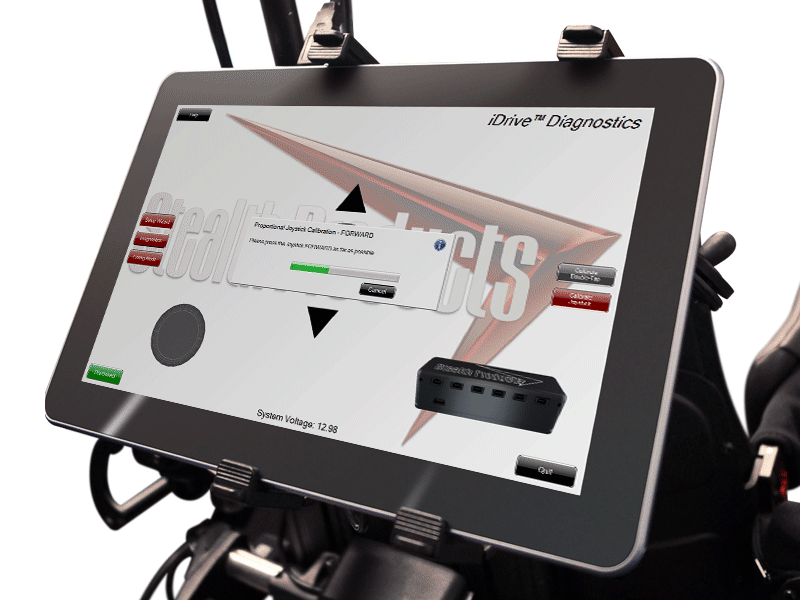 You can choose among Pneumatic (Sip & Puff), Mechanical (Touch), Proximity (Sensors) and Fiber Optics (Sensors) to input data into the i-Drive Interface. 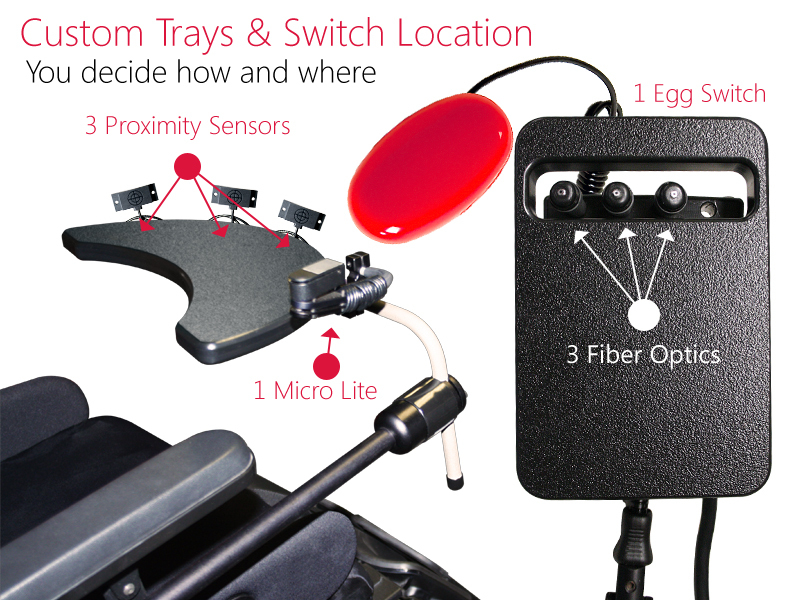 Extra sensors can be added using i‑Connect. Each input can be configured independently. 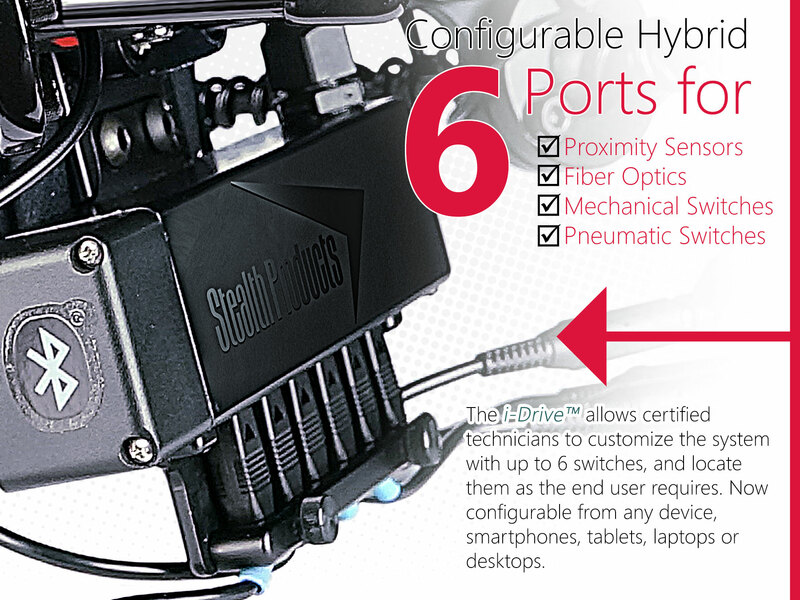 These switches require any type of direct physical contact in order to be activated. They do not require a power source. These are electronic switches which do not require any physical contact. The proximity sensor creates an imaginary bubble, or light beam, which detects any non metallic body that moves close and enters this sensory bubble, activates the sensor, and sends the signal to the device. They require 12V A/C power provided by the interface. This type of switch should only be considered when the individual has controlled abilities of his/her extremities, moderate to normal force, and precise depth perception. For example, this is perfect for users with some control of their hands or feet. Even though it is considered a mechanical switch, this pneumatic option works perfectly for individuals that can perform a mechanical task inhaling (sipping) and exhaling (puffing) but lack of control of their extremities. 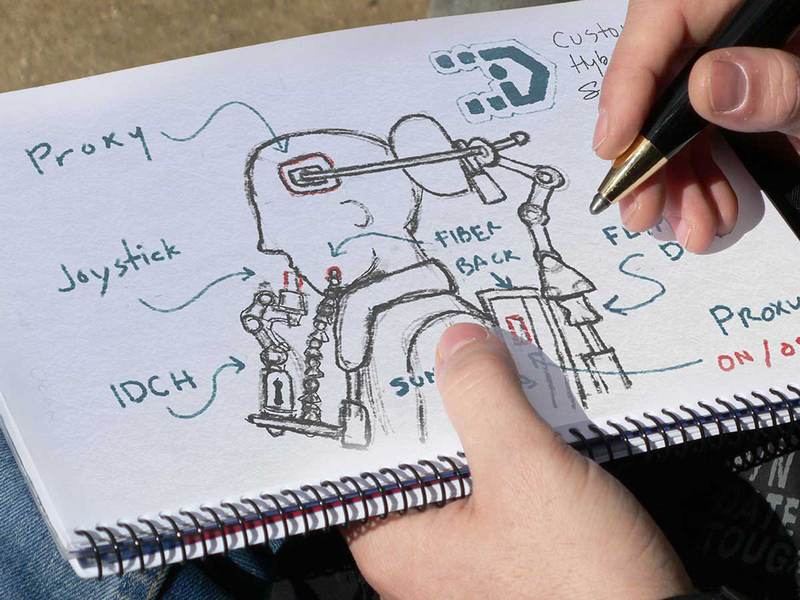 It will convert breath into a mechanical equivalent of two (2) regular mechanical switches. As the name implies, no physical contact is required in order to activate a function. Capacitive Proximity sensors as mentioned, creates an invisible area like a force field when invaded, and activates the switch. Fiber Optics emit a focused beam of light, that when interrupted, send a signal to the receiver. 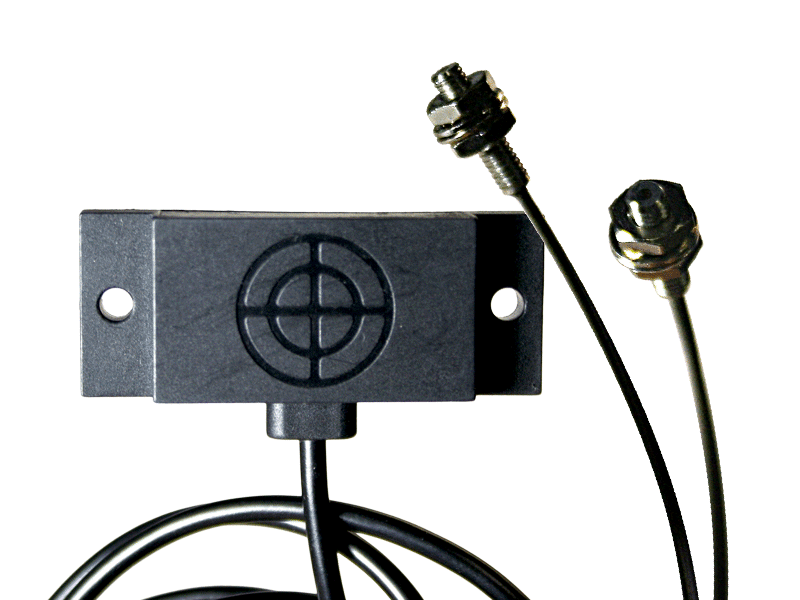 Photoelectric Sensor detects the presence of an object by using a light transmitter and a photoelectric receiver. These sensors are perfect for individual with minimal, limited, or no functionality in their extremities. Technicians can also test input locations on-site with individual and system in place. 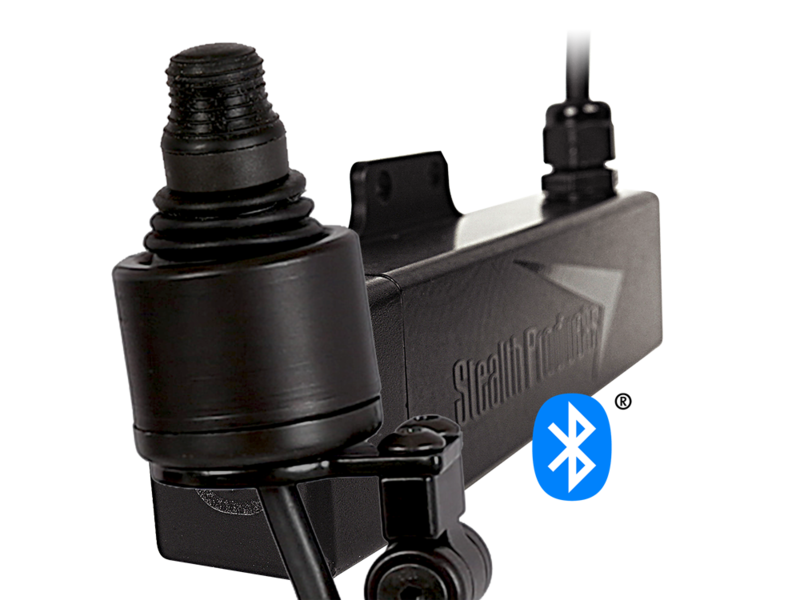 Combined switches and sensors to accomplish a more robust and reliable drive control environment. 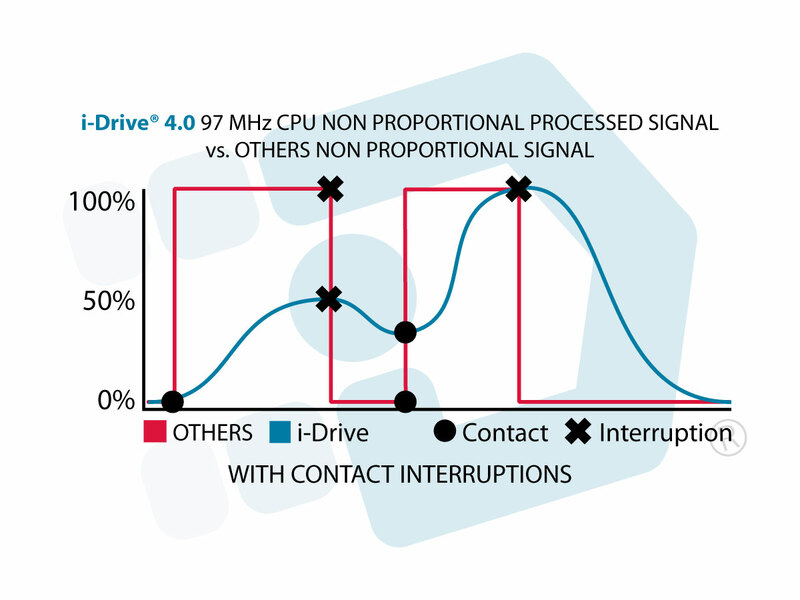 The i‑Drive integrated 97 MHz CPU processes signals. These signals are received independently from each input. Active input is priority. 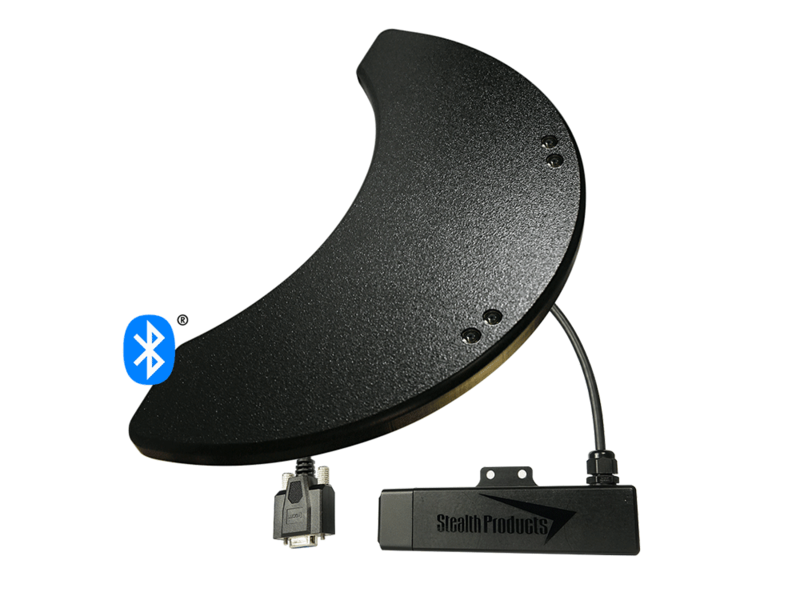 If there is any interruption, the processed signal allows a smoother transition from one active signal to the other, preventing the user from stuttering, causing the system to auto reset. One of the most challenging points for Drive Control configurations relays back to proper seating posture. 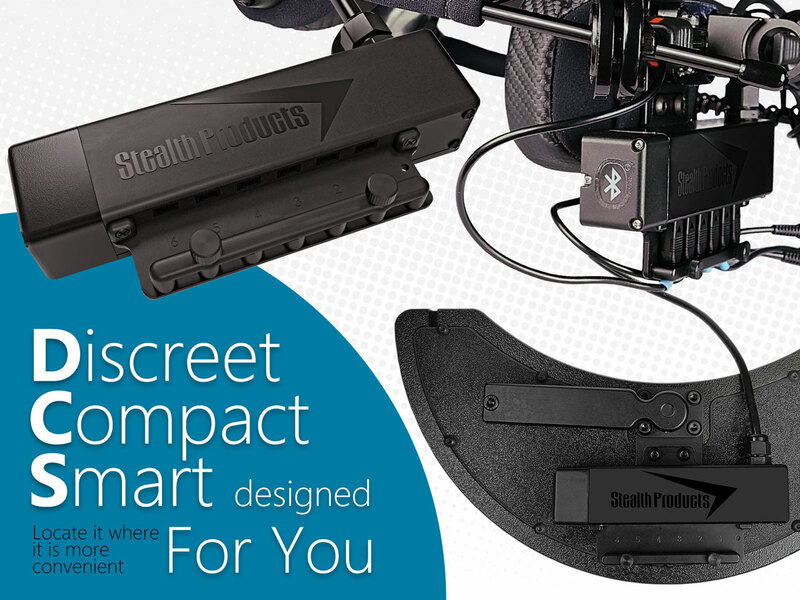 Our i‑Drive is fully compatible with one of the most versatile collections of positioning solutions, Stealth has you covered from head to toe, literally! When planning system accessibility and seating positioning options, think about your client's strengths and weaknesses. Like the fulcrum that absorbs more of the weight in a second class lever, you want the user effort to maintain control over the resistance supported by the fulcrum (the seating), not the other way around. Proper Seating (the fulcrum) maintained constant support resulting in a more confident driver. With slight effort, the user is able to have full control through the optimum configuration of the i‑Drive system, which translates the slightest effort into a full, more stable, effort. The control gained will create confidence and trust, generating a smoother drive and a faster learning curve. Placing the switches in the right position is just part of the configuration. 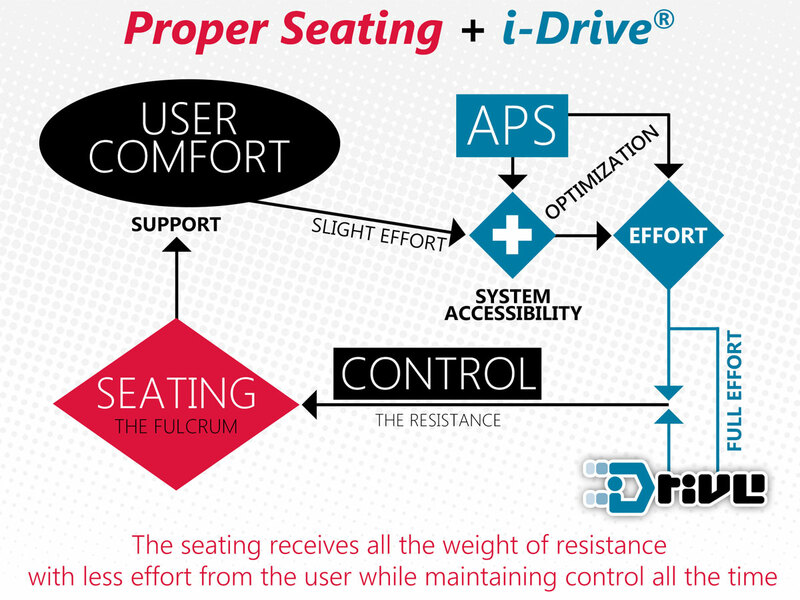 By creating this fulcrum, or cushion of resistance, with the unlimited options available from Stealth Full Seating line, the customization power of the i‑Drive system is infinite. 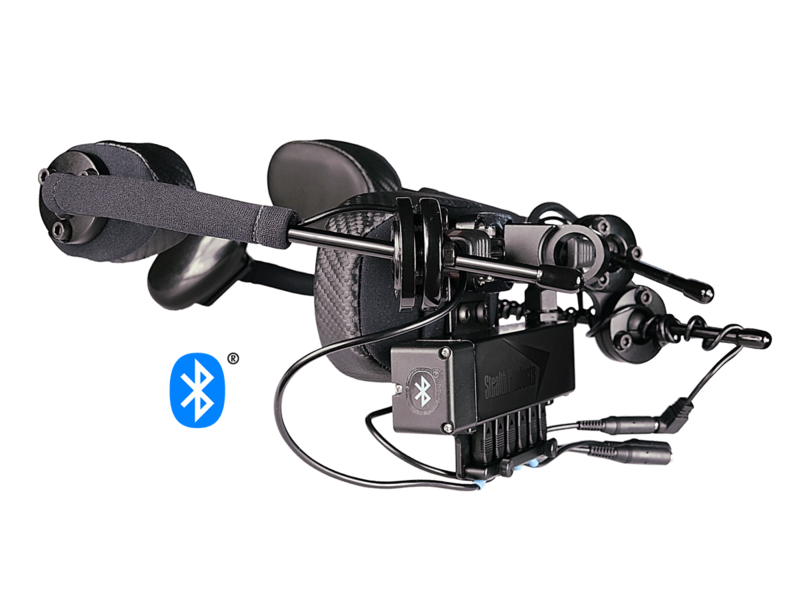 The i‑Drive interface is discreet, compact, and smartly designed so it can be located wherever you need it. You are in control of the layout, based on actual needs. Design a clean configuration by placing the interface in a more neutral position between the switches location. Avoid too many lines travelling from switches or sensors to the interface. Build a customized system, by either reconfiguring an existing system or letting us help you build your own. 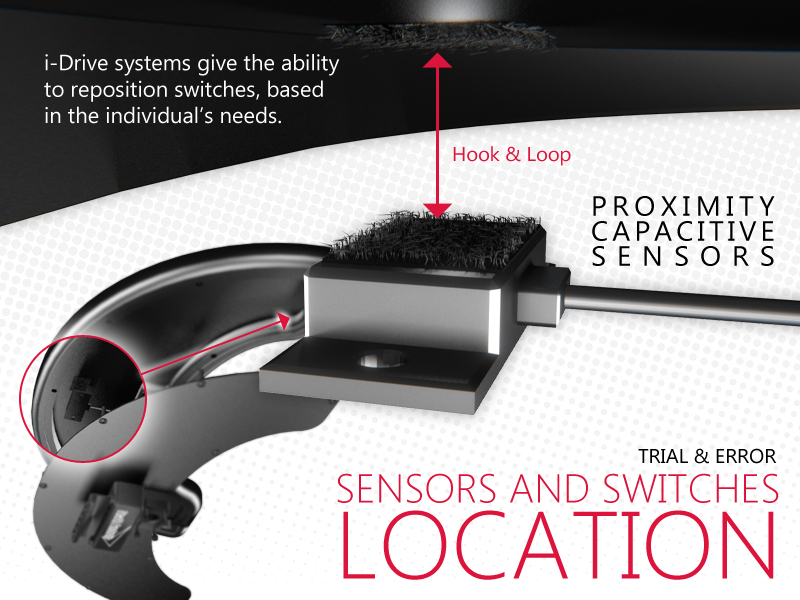 While testing the system, you are able to arrange switch locations until finding the right spot. 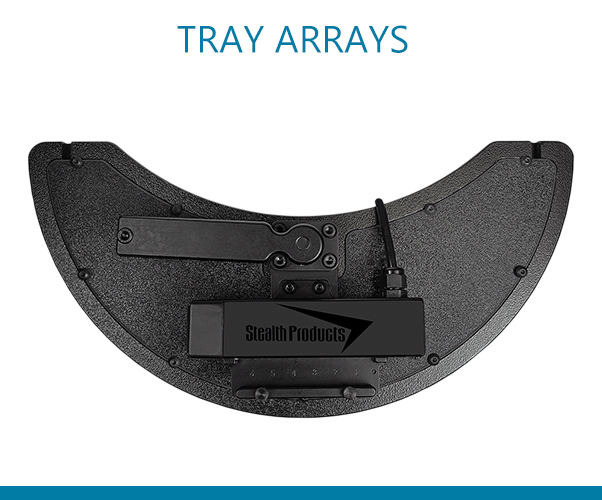 The i‑Drive head array systems can be fully customized. Aesthetic configurations are available. 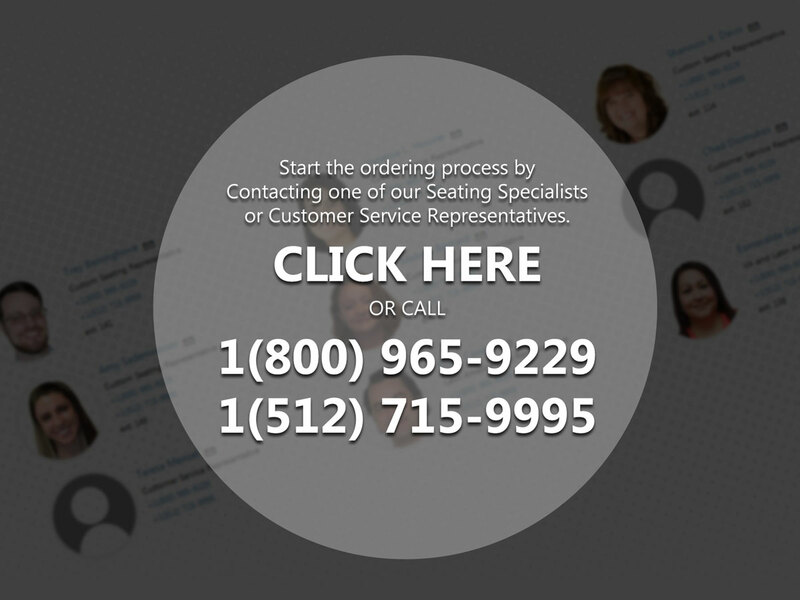 Choose contact upholstery and non contact color choices to match the user preferences or the frame looks. 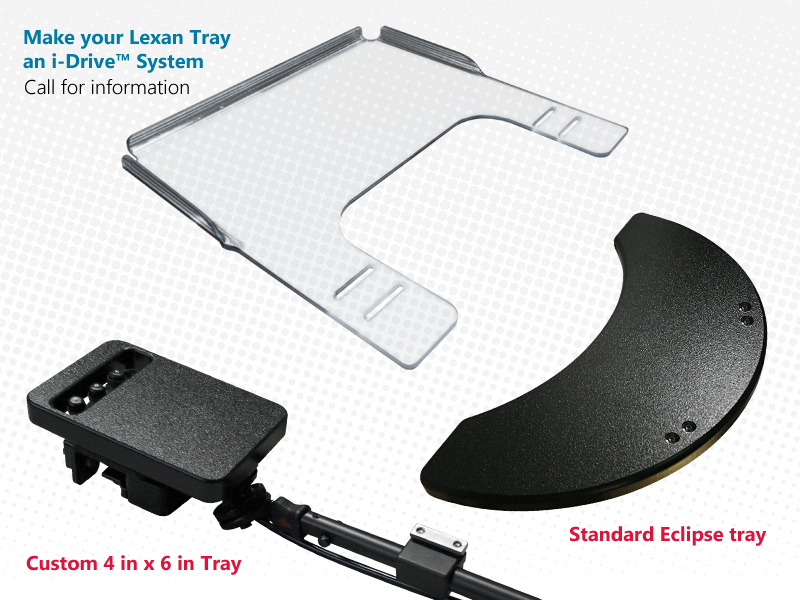 As a manufacturing company we can conceptualize and design any tray system with optimized positioning aids and hardware. Use your configuration notes to set a system with combined inputs and custom tray layout and design. 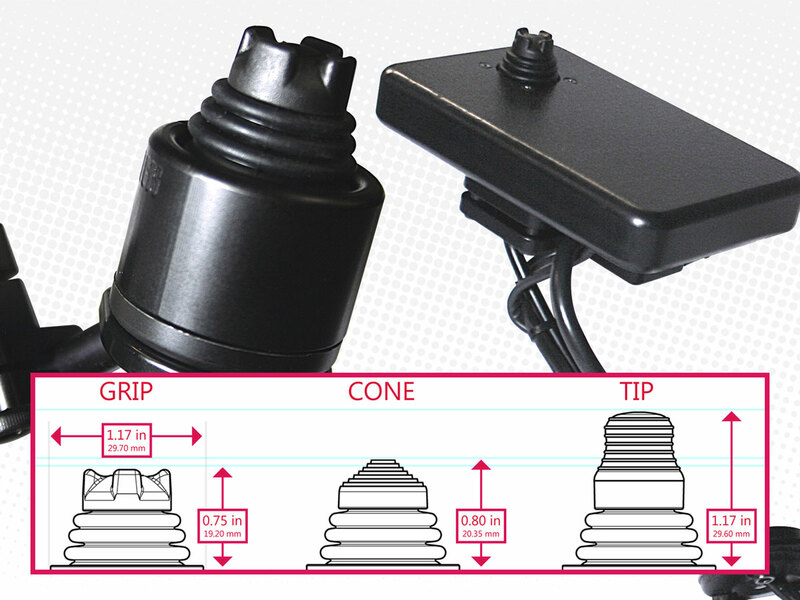 Precision Mini Proportional joystick can be positioned where needed. 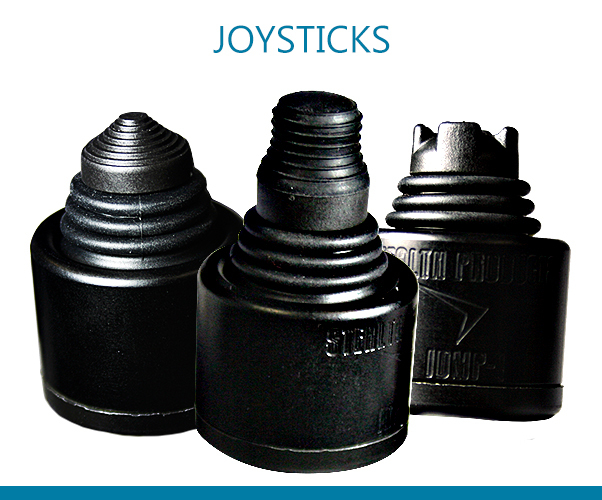 Customize your joystick with different handle options available. No other drive control gives you so much configuration power.